Have you ever wanted to experience real Italian life? Then come to San Diego native Marlane Miriello’s kitchen in Tuscany this spring where she hosts the stress-busting and delight-for-the-senses Il Campo Cucina. Seriously. This is not some put-on-your-white-coat cooking school. With Marlane as your guide, you help prepare delectable dishes with an Italian mama in her own kitchen. Then, you’ll sit down to dinner in mama’s Tuscan home and enjoy the company of students, instructors and friends as you dine on such culinary masterpieces as ginestrata (a classic egg soup), crespelle fiorentine (ricotta-and-Swiss chard crepes), semifreddo torrone (a desert made of zabaglione, whipped cream and nougat candy). What Is Il Campo Cucina Really? Il Campo Cucina is actually much more than Marlane or her cooking school. You see, Marlane’s “cucina” is located just three hours north of Rome in the walled medieval town of Radicondoli. With about 600+ residents, the villagers of this ancient castle town live peacefully and work together as a close-knit community. 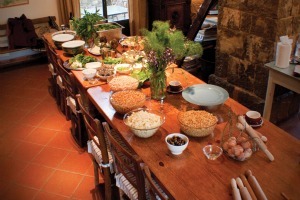 As a student of Il Campo Cucina’s seasonal cooking school, you walk Radicondoli’s ancient cobble stone streets and sample chocolates in a quaint shop, but villagers warmly welcome you into their homes, gardens, vineyards and farms to learn heirloom recipes and centuries-old family trades. Surrounded by olive groves, prolific vineyards, fields of produce and dark-green forests, Radicondoli’s villagers purchase the freshest fruits and vegetables at their community co-op, drink excellent local wines, and use hand-pressed olive oils, grains, meats and cheeses in their flavorful Tuscan dishes, Plus, the forests provide an array of mushrooms, herbs, and wildlife that are added to the villager’s stew pots. In addition, Il Campo Cucina also offers tours of local wineries, hikes to farms in the Tuscany countryside, excursions to some of the most historic cities in Italy and visits to local festivals and country markets. A resident of San Diego’s Coronado enclave, author Marlane Miriello says she was prompted to create Il Camp Cucina after being immersed herself in the easy-going village lifestyle in Radicondoli. As an author and cooking aficionado, Marlane makes each day a different hands-on experience. For instance, you may lunch with a local sheep herder to learn how to make cheese from fresh sheep’s milk or roll out homemade pasta in a villager’s kitchen. Serious cooks and slow food aficionados can take advantage of Il Campo Cucina’s spring classes, which includes an all-inclusive week of Italian cooking, wine tasting and sightseeing around Tuscany. The seven-day stay includes lodging in Radcondoli with meals and local wines provided, plus multi-course spreads at restaurants. The cooking school provides printed recipes and English interpreters. Il Campo Cucina is offering a special discount of $500 off the regular price through March 31 for any spring 2011 week. Reserve any fall 2011 week and receive a $250 discount off the regular price. Joanne Tucker is a freelance travel and dining writer based in Costa Mesa, Calif.